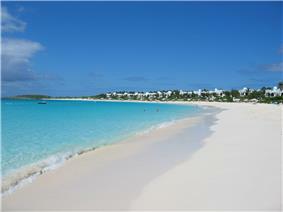 Anguilla ( ) is a British overseas territory in the Caribbean. It is one of the most northerly of the Leeward Islands in the Lesser Antilles, lying east of Puerto Rico and the Virgin Islands and directly north of Saint Martin. The territory consists of the main island of Anguilla itself, approximately 16 miles (26 km) long by 3 miles (5 km) wide at its widest point, together with a number of much smaller islands and cays with no permanent population. The island's capital is The Valley. The total land area of the territory is 35 square miles (90 km2), with a population of approximately 13,500 (2006 estimate). 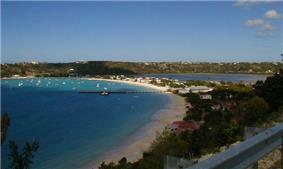 Anguilla was first settled by Amerindian tribes who migrated from South America. The earliest Native American artefacts found on Anguilla have been dated to around 1300 BC; remains of settlements date from AD 600. The Arawak name for the island seems to have been Malliouhana. The date of European invasion and colonisation is uncertain: some sources claim that Columbus sighted the island during his second voyage in 1493, while others state that the island was first "discovered" (for colonisation) by the French explorer René Goulaine de Laudonnière in 1564. 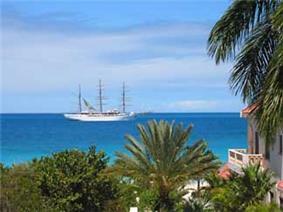 Traditional accounts state that Anguilla was first colonised by English settlers from Saint Kitts beginning in 1650. In this early colonial period, however, Anguilla sometimes served as a place of refuge and recent scholarship focused on Anguilla has placed greater significance on other Europeans and creoles migrating from St. Christopher, Barbados, Nevis and Antigua. 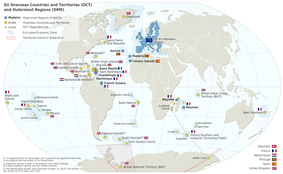 The French temporarily took over the island in 1666 but returned it to English control under the terms of the Treaty of Breda the next year. A Major John Scott who visited in September, 1667, wrote of leaving the island "in good condition" and noted that in July, 1668, "200 or 300 people fled thither in time of war." During the early colonial period, Anguilla was administered by the British through Antigua; in 1825, it was placed under the administrative control of nearby Saint Kitts. 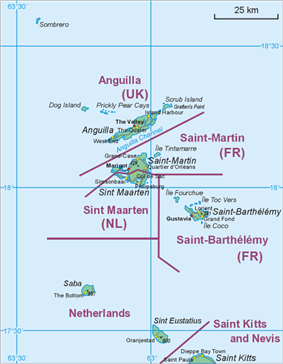 In 1967, Britain granted Saint Kitts and Nevis full internal autonomy. Anguilla was also incorporated into the new unified dependency, named Saint Christopher-Nevis-Anguilla, against the wishes of many Anguillians. This led to two Anguillian Revolutions in 1967 and 1969 headed by Ronald Webster. 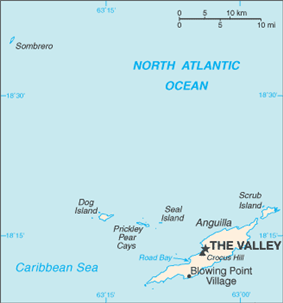 The island briefly operated as the independent "Republic of Anguilla". The goal of the revolution was not independence per se, but rather independence from Saint Kitts and Nevis and a return to being a British colony. British authority was fully restored in July 1971 and in 1980 Anguilla was finally allowed to secede from Saint Kitts and Nevis and become a separate British Crown colony (now a British overseas territory). The majority of residents (90.08%) are black, the descendants of slaves transported from Africa. Growing minorities include whites at 3.74% and people of mixed race at 4.65% (figures from 2001 census). According to the 2001 census, Christianity is Anguilla's predominant religion, with 29.0 percent of the population practising Anglicanism. Another 23.9 percent are Methodist. Other churches on the island include Seventh-day Adventist, Baptist, Roman Catholic (served by the Roman Catholic Diocese of Saint John's - Basseterre, with see at Saint John on Antigua and Barbuda) and Jehovah's Witnesses (0.7%). Between 1992 and 2001 the number of followers of the Church of God and Pentecostal Churches increased considerably. There are at least 15 churches on the island, several of architectural interest. Although a minority on the island, it is an important location to followers of Rastafarian religion – Anguilla is the birthplace of Robert Athlyi Rogers, author of The Holy Piby which has had a strong influence on Rastafarian beliefs. Various other religions are practised as well. 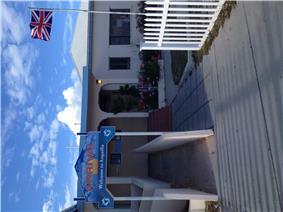 Today most people in Anguilla speak a British-influenced variety of "Standard" English. Other languages are also spoken on the island, including varieties of Spanish, Chinese and the languages of other immigrants. However, the most common language other than Standard English is the island's own English-lexifier Creole language (not to be confused with Antillean Creole ('French Creole'), spoken in (ex-)French islands such as Martinique and Guadeloupe). 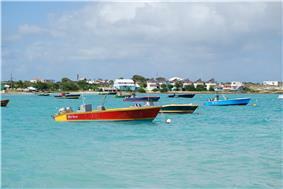 It is referred to locally by terms such as "dialect" (pronounced "dialek"), Anguilla Talk or "Anguillian". It has its main roots in early varieties of English and West African languages, and is similar to the dialects spoken in English-speaking islands throughout the Eastern Caribbean, in terms of its structural features and to the extent of being considered one single language. Linguists who are interested in the origins of Anguillian and other Caribbean Creoles point out that some of its grammatical features can be traced to African languages while others can be traced to European languages. Three areas have been identified as significant for the identification of the linguistic origins of those forced migrants who arrived before 1710: the Slave Coast, the Slave Coast and the Windward Coast. The Anguilla National Trust (ANT) was established in 1988 and opened its offices in 1993 charged with the responsibility of preserving the heritage of the island, including its cultural heritage. The Trust has programmes encouraging Anguillian writers and the preservation of the island's history. In 2015, Where I See The Sun – Contemporary Poetry in Anguilla A New Anthology by Lasana M. Sekou was published by House of Nehesi Publishers. Among the forty three poets in the unprecedented collection are Rita Celestine-Carty, Bankie Banx, John T. Harrigan, Patricia J. Adams, Fabian Fahie, Dr. Oluwakemi Linda Banks, and Reuel Ben Lewi. The island's cultural history begins with the Taino Indians. Artifacts have been found around the island, telling of life before European settlers arrived. Anguillian cuisine is influenced by native Caribbean, African, Spanish, French and English cuisines. Seafood is abundant, including prawns, shrimp, crab, spiny lobster, conch, mahi-mahi, red snapper, marlin and grouper. Salt cod is a staple food eaten by itself and used in stews, casseroles and soups. Livestock is limited due to the small size of the island and people there utilise poultry, pork, goat and mutton, along with imported beef. Goat is the most commonly eaten meat, utilised in a variety of dishes. Due to its internationally recognised culinary community, the island has enjoyed a reputation as "the culinary capital of the Caribbean." This reputation was reinforced with the publication of the (WE) Are Anguilla Cookbook, a guide to the cuisine of Anguilla featuring emerging and established local chefs, who share both their signature dishes and personal anecdotes regarding the island’s epicurean culture. A publishing contract was secured by The Britto Agency, which had conceived the idea for the book itself. The island's burgeoning musical community made history with the recording of Sounds of Anguilla (Volume 1), the first album ever comprised solely of artists from a single Caribbean island representing multiple musical genres: pop, reggae, hip-hop, soca music and R&B. The production was the brainchild of Marvet Britto of the Britto Agency, the island's global public relations and brand-architecture firm. Britto secured a recording contract with Massenburg and both served as executive producers along with Haydn Hughes, at that time the Parliamentary Secretary Responsible for Tourism. Sounds of Anguilla (Volume 1) debuted on iTunes on June 30, 2015 and included celebrated Anguillian musicians such as Bankie Banx, Amalia Watty, True Intentions and Gerswin Lake and The Parables. A branch of the Saint James School of Medicine was established in 2011 in Anguilla, It is a private, for-profit medical school headquartered in Park Ridge, Illinois. The school's mission is to help motivated students become a doctor, irrespective of ethnic, religious and cultural backgrounds. The school was founded on the belief that a high quality medical education should be affordable and accessible to everyone with the commitment and the ability to succeed in a career in medicine. 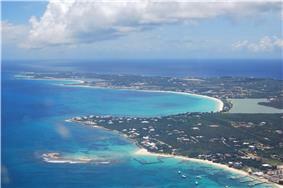 Anguilla is also the home of Zharnel Hughes, who specialises in the 100m and 200m sprint. He won the 100m in the 2013 CARIFTA Games in a time of 10.44 seconds, despite his time being some way below his PB. Anguilla's tourism industry received a major boost when it was selected to host the Marvet Britto of the Britto Agency, which oversees Global Brand Strategy and Public Relations for the island. ^ British Colonial and State Papers 1661-1668, 16 November 1667 and 9 July 1668. ^ a b Walicek, Don E. 2009. "The Founder Principle and Anguilla's Homestead Society," Gradual Creolization: Studies Celebrating Jacques Arends, ed. by M. van den Berg, H. Cardoso, and R. Selbach. (Creole Language Library Series 34), Amsterdam: John Benjamins, pp. 349-372. ^ Walicek, Don E. 2011. "Christianity, Literacy, and Creolization in Nineteenth-Century Anguilla." In Anansi's Defiant Webs, Contact, Continuity, Convergence, and Complexity in the Language, Literatures and Cultures of the Greater Caribbean, ed. by N. Faraclas, R. Severing, et al. Willemstad: University of Curaçao and Fundashon pa Planifikashon di Idioma, pp. 181-189. ^ Hodge, S. Wilfred (2003). Bethel- the road - and due west. In Wilbert Forker (Ed. ), Born in slavery: A story of Methodism in Anguilla and its influence in the Caribbean (pp. 20-29). Edinburgh: Dunedin Academic Press. ^ Singler, John. 1993. African influence upon Afro-American language varieties: A consideration of sociohistorical factors. In Africanisms in Afro-American language varieties, S. Mufwene and n. Condon (eds. ), 235-253. Athens, GA: University of Georgia Press. ^ a b c d e f g Robinson, Peg. "Foods That Are Important in Anguilla." USA Today Travel. Retrieved July 2011. ^ a b Higgins, Michelle. 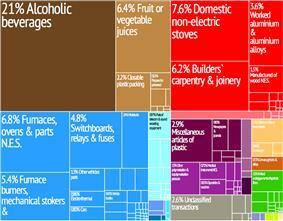 (28 January 2007). "For Foodies: Anguilla." The New York Times - Travel. Retrieved July 2011.